A popular way to collect postal history is to build the collection around a set of stamps the collector particularly likes. The ideal set will have been used for a number of years, have significant variety in the stamps themselves (lots of colors is good!) and cover a period of years during which there was interesting mail contact with other countries, rate changes and maybe even the introduction of airmail! There is a little known set from South America that matches all these requirements. 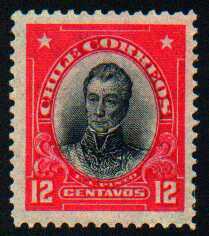 It is known among collectors as the "Presidentes of Chile". The first set, issued in 1911, was produced by the American Banknote Company. A set of 15 stamps in its basic form, it is a superb example of the engraving and stamp production talents of that company at the time. You will find it in Scott as #98-112, and Stanley Gibbons as #135-49. (The pictures in Scott do not do this set justice!) Another seven values (color changes plus additional values) were supplied by ABNC during 1912-13. In 1915, production was taken over by the Chilean Mint. Three values from the original set by the American Banknote Co.
Local production resulted in a change to typography and lithography from engraving and resulted in a number of interesting combinations of frames and centers using one of each of the printing methods. 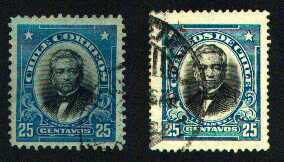 Over the following 15 years, the stamps were redrawn, watermarked paper was introduced and many varieties that did not find their way into a listing in the standard catalogs appeared. 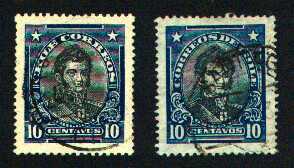 Two locally printed varieties of the 10c. 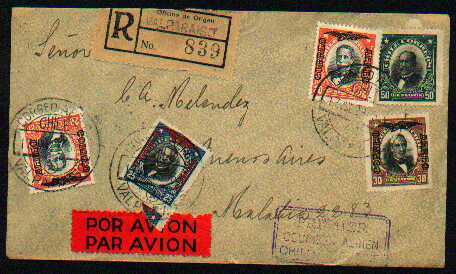 Notice "Chile Correos" and "Correos de Chile"
The original ABNC 25c and a locally produced (Chilean Mint) later issue. 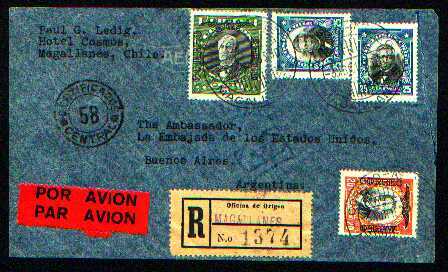 As an added bonus, the set was chosen for overprinting for use as the first airmail stamps (ignoring the first 1927 set in the catalogs which was for use on a local Santiago-Valparaiso flight). 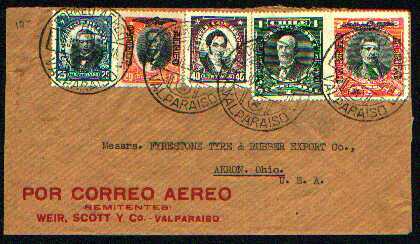 As a result, all the interesting covers of the formative airmail years of 1928-32 bear the Presidente airmails. 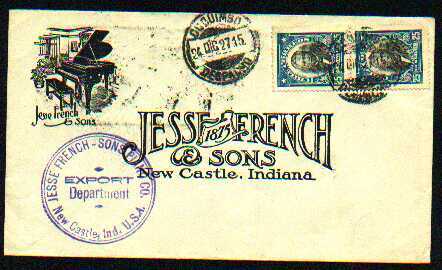 In my opinion, these covers are some of the most attractively franked airmail covers in the world, nearly always carrying multiple copies of different stamps in many colors. 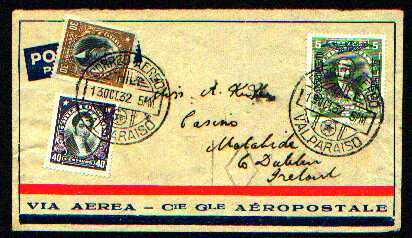 Three of many values overprinted for airmail use. First Flight to Argentina - July 17, 1929. One of 540 flown. All considered, this set of stamps represents an astonishingly fruitful field of study in a philatelic area that is not overly crowded and has many different facets to explore. Chile specialist groups exist -small, but amazingly helpful and experienced. There is also a good depth of existing study and articles upon which to draw. If you are interested, contact me at roy@lingens.com and I will put you in touch by email.